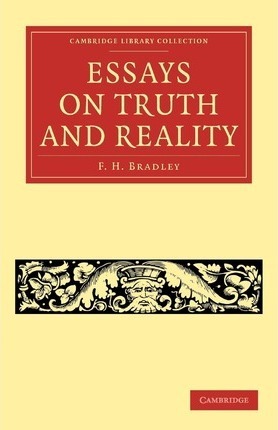 F. H. Bradley (1846-1924) was the foremost philosopher of the British Idealist school, which came to prominence in the second half of the nineteenth century and remained influential into the first half of the twentieth. Bradley, who was educated at Oxford, and spent his life as a fellow of Merton College, was influenced by Hegel, and also reacted against utilitarianism. He was recognised during his lifetime as one of the greatest intellectuals of his generation and was the first philosopher to receive the Order of Merit, in 1924. This collection of some of Bradley's most important journal articles was first published in 1914. He examines coherence and identity theories of truth, and discusses pragmatism and radical empiricism. The book contains extensive discussion of the work of Bertrand Russell and William James, while other essays cover a range of different subjects such as faith, memory, error and God. Preface; 1. Introductory; 2. Faith; 3. On floating ideas and the imaginary; 4. On truth and practice; 5. On truth and copying; 6. On our knowledge or immediate experience; 7. On truth and coherence; 8. Coherence and contradiction; 9. On appearance, error, and contradiction; 10. A discussion of some problems in connexion with Mr. Russell's doctrine; 11. On some aspects of truth; 12. Some remarks on memory and inference; 13. On memory and judgement; 14. What is the real Julius Caesar? ; 15. On God and the absolute; 16. On my real world; Concluding remarks; Index.